A lazy day today, with a lot of the day being spent hanging out in the villa and relaxing in the pool. We really needed the day off what with the ills we’ve all been having! …quite the stockpile eh?! Since we didn’t think we’d be going back to Orlando for another couple of years I made sure I stocked up on favourites like Shake ‘n’ Bake and packets mixes we can’t buy here! Then there are all the Halloween treats, different M&Ms, plus sprinkles and other cake making goodies! Late afternoon saw me feeling quite rough and I fell asleep for a couple of hours on the sofa – something I rarely do. The start of this holiday isn’t going so well is it? I woke up and got myself refreshed and ready to go out for our belated wedding anniversary dinner at ‘Ohana. …there is something very exciting to see it, and know that you are entering the World! As we pulled up to the Polynesian Resort the weather started to turn a bit horrid – black clouds and the wind really picked up – a storm was aproaching! We parked up and as we began to walk to the entrance, spots of rain started to fall. I hoped they would clear up for later as we had planned to watch Wishes from the beach. This was the first time we’ve seen a resort at Walt Disney World, and all I can say is wow! It is absolutely stunning and I would love to be able to stay here one day. I love the themeing, the flowers and foliage and the general feel of the place was wonderful. …it is just stunning! And I took a few minutes just snapping photos! 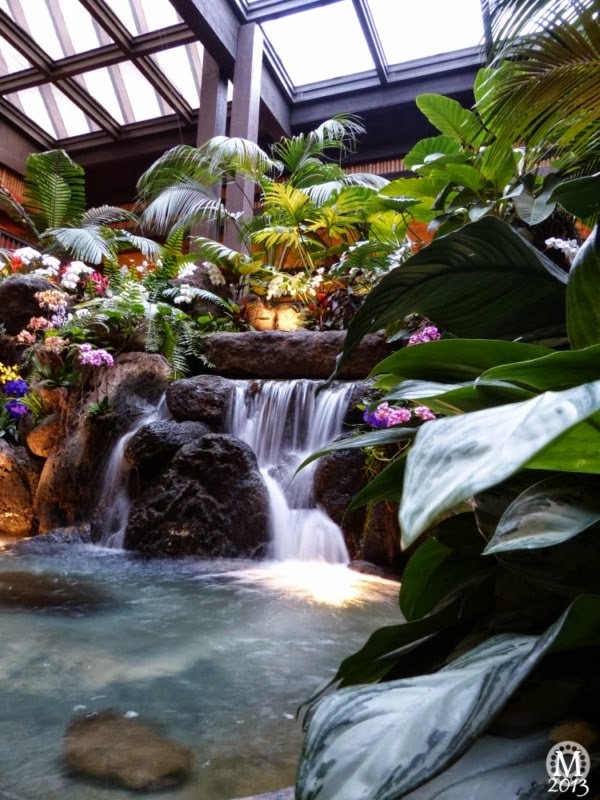 Since writing this report I’ve learned that the waterfall will be removed when the Polynesian Resort gets a refurb! What a shame – it’s so pretty and such a wonderful feature. We were still a little early for our advance dining reservation, so we took a wander around the shops that were in the lobby area. The Boutiki was a great shop – I could have spent a few dollars in there, but after already spending a small fortune on cake decorating goodies that day I didn’t want to go too far over our daily spends budget! I particularly had my beady eye on these tiki glasses, with a view to going back to and purchasing them…I never did – every time we decided to visit the Polynesian Resort again to watch Wishes from the beach, we had rain! And I really wanted to buy a coconut postcard and send it home! Yes, a real coconut that you can send as a postcard – crazy! ‘Ohana is on the 1st floor (or 2nd if you are American), so we took the lift up there and let the reception desk know that we were there. We were given a pager that would go off when our table was ready. As a surprise for hubs, I ordered a cake at the desk to come out with dessert. We took a wander around this level of the hotel whilst waiting to be bleeped for our reservation. An above view of the waterfall – still gorgeous! Kona Island – which is a sushi bar – awesome! And of course, into the gift shop…but no sooner had I taken a photo of Hawaiian Mickey, our pager went off and we walked back around to ‘Ohana. Greeted by a chorus of ‘Aloha’ as we walked in, a server took us through into the restaurant, explaining how service in ‘Ohana works. Food is served family style – the starters are brought to the table for all to share, and the barbecued meats are served from a huge skewer – if you want more, you just ask. This sort of service is similar to what hubs and I have experienced at the Brazilian restaurant we like going to in town. As we walked through, the server picked up a plate with some pineapple coconut bread and guided us to our table past the open fire pit barbecue area. We were sat at a table and our waiter arrived, introducing himself and taking a drinks order. I had my beady eye on a cocktail that was served in a whole pineapple…but since I am the driver, I couldn’t partake – I’m looking forward to staying on resort next year so that I can have a few drinks! Here is the aforementioned pineapple coconut bread. The flavour of coconut didn’t come through because my husband was able to eat it – and he despises coconut! The boy was unimpressed with it (but he’s not one to try out new foods) and waited patiently for something he could eat! Whilst waiting for drinks and appetisers, I took some photographs (on my iPhone now) of our surroundings. It’s busy restaurant, but felt cosy somehow. We really liked the place! A bowlful of mixed greens with honey-lime dressing came out along with a platter of pork fried dumplings and glazed chicken wings. The salad was lovely and refreshing, and the dumplings and chicken wings were delicious. We finished off all but the salad – waiting to use it up whilst eating the meat course. Another waiter whizzed by and nearly took the bowl away, thinking we’d finished, which annoyed me a bit – he didn’t even ask! So I quickly divided up the salad between Steve and myself (Liam wasn’t going to touch it!) so that the same wouldn’t happen again. We were served by a few different waiting staff with skewers of various meats – sirloin steak, pork loin, turkey and shrimp. They ask if you’d like any, and serve a portion – one or two pieces, but if you want more, you can ask. Generally you see them going table to table and can manage to call one over, or ask your waiter who will bring you what you would like. We also asked for some french fries for Liam and the waiter was more than happy bring a plate of them for him. I particularly enjoyed the steak which was super tender and the shrimp were delish too! Whilst dining there was a woman walking around playing the ukulele, and then inviting people to learn the hula – all very entertaining. As was the race around the restaurant with kids pushing a coconut around with a broom! Stay out of the way! All feeling pretty full by now, dessert was brought to us in the form of banana and coconut bread pudding, which was too coconutty for hubs, so he didn’t have any. The boy and I did devour it though – it was lush! At this point the waiter put our check down on the table and I asked him where our celebration cake was – he looked very embarrassed and ran off to check. He came back very apologetic saying that the information at the front desk was not relayed to him and said that the cake was on him. He wished us a happy anniversary and offered to cut the cake – we declined asking if he would mind boxing it up as we were all pretty stuffed! We paid our bill – leaving him a tip to cover the cake – it wasn’t his fault, and I couldn’t handle knowing that it would come out of his wages. We paid the bill ($119.97 plus tip) and took our boxed cake. We paid a visit back to the gift shop where I bought Liam a Donald Duck (seen in the photo back up the top there somewhere!) and asked for a bag to carry our cake in, which they provided me with. We went downstairs and a bride and groom were walking through the lobby – lovely! We hung around for a bit hoping that the rain might ease off and we could go and watch the fireworks, but with the chocolate cake now in hand and generally feeling tired by now (amazing what a lazy day can do to you – make you feel even more lazy!) we decided to make a move back to the villa. However, before leaving, we saw a guy handing out leis to guests who, it turned out, were going to the Spirit of Aloha dinner show. I thought we would receive a lei when going into ‘Ohana, (but didn’t) I asked how it was possible to get one. He asked if we were going to the show, and I said no, but we were up in ‘Ohana. He whispered that I could have one and then proceeded to hand one to each of us! Yay! Back to the car, and the drive home ready for our Gospel Brunch at House of Blues tomorrow! Oh, and if you’re wondering how the cake was – it was so yummy! We didn’t cut it until a couple of days later, and then it lasted for another few days after that!